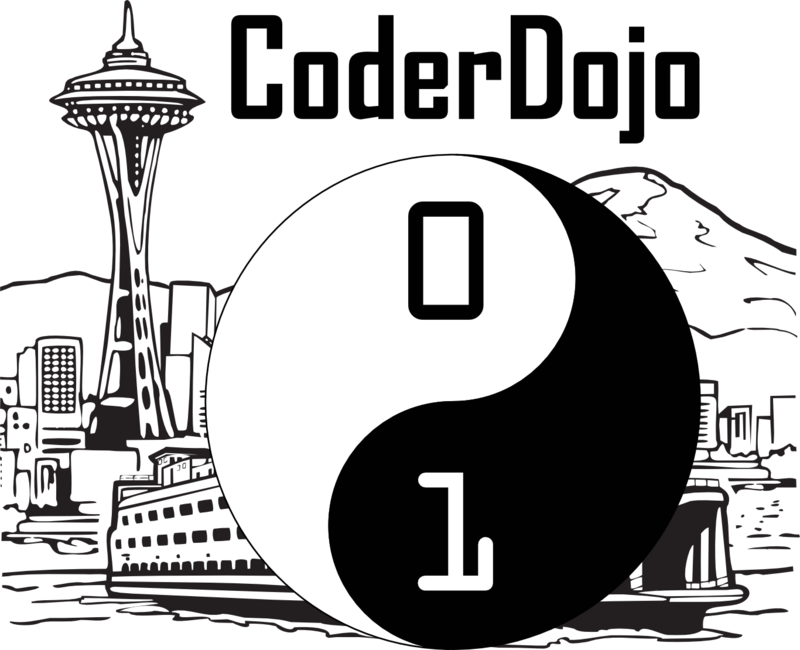 Seattle CoderDojo is a free STEM skills meetup for kids, powered by volunteers, donors, and sponsors. Parents must remain on premises. Cheap parking is available nearby. ONE TICKET PER CHILD PLEASE. IF YOU ARE UNSURE, PICK THE BEGINNER ROOM. WE’LL HELP YOUR CHILD FIND THE RIGHT ROOM WHEN YOU ARRIVE..
Ages below (except for FreeCodeCamp.com) are recommendations and not strictly enforced. If your cild has never coded or had just a little experience a while back, get a ticket for this room. We’ll get them started on beginner tutorials to get them some confidence and some basic concepts. Scratch is a programming tool for kids, created by MIT. It lets kids create programs by fitting together blocks on screen. This is a consistently popular room. What do you want to learn? Kids can bring their own projects to work on and get help with, or they can take advantage of our learning paths which combine free online tutorials and project ideas to help them achieve mastery of various tech skills and programming languages. Week 3 of 3 for Coding Rocket League with Scratch! This workshop will have us working in teams to write scratch code for cars in the video game Rocket League. No game (or experience with the game) is required, so come check out this cool workshop! Please note: some scratch experience would be helpful for this room. Through FreeCodeCamp.com, teens can learn topics like web site design, building APIs and microservices, data visualization, and information security. We’ll get your child started with a free online education and certification program and help them when they run into issues. Each certification requires approximately 300 hours of lessons and project work, so plan for your child to work on this at home as well. ALL KIDS MUST HAVE AN ADULT ATTEND ALONG WITH THEM. NO DROP-OFFS. ONE ADULT CAN BE THE GUARDIAN FOR MULTIPLE KIDS. WE HAVE COFFEE. FOR THE SAFETY AND SECURITY OF ALL OUR GUESTS AND TO COMPLY WITH AMAZON’S BUILDING ACCESS RULES, ALL ADULTS 18 AND OVER WILL BE REQUIRED TO SHOW PHOTO ID AT CHECK-IN. PARKING IS NOT FREE, BUT THE GARAGE ACROSS THE STREET IS $2.44 (INCLUDING CITY FEES AND TAXES) FOR THE *DAY*. ENTER ON REPUBLICAN ST, BETWEEN TERRY AVE N AND BOREN AVE N. CONSTRUCTION MAY MAKE IT HARD TO SEE THE ENTRANCE, WHICH IS JUST INSIDE THE MOUTH OF AN ALLEY BETWEEN THE CONSTRUCTION AND THE BA-BAR RESTAURANT. * PLEASE BRING A LAPTOP IF YOU CAN. WE HAVE SOME ON-SITE LOANERS, BUT WE DO NOT GUARANTEE WE WILL HAVE ENOUGH TO MEET DEMAND. SEE WWW.SEATTLECODERDOJO.COM FOR MORE DETAILS ABOUT OUR VOLUNTEER GROUP.